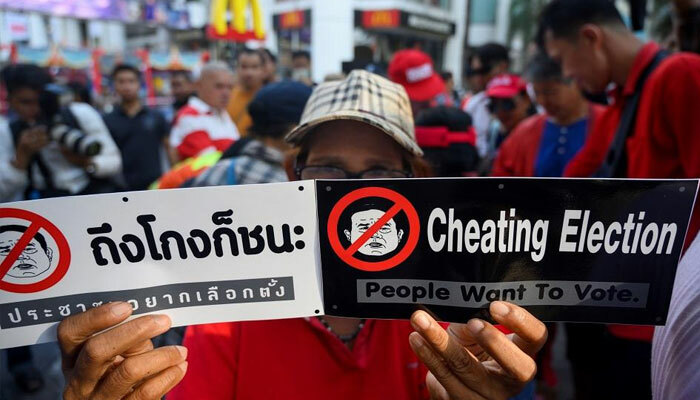 Thai demonstrators on Sunday protested against alleged cheating in the junta-ruled kingdom´s first election since a 2014 coup, a week after the controversial poll sowed confusion over the ballot results. A military-backed party and its main rival tied to a self-exiled billionaire have both claimed the right to lead the government as inconsistent tallies released by the Election Commission have raised suspicion among voters. The junta-aligned Phalang Pracharat party clinched the popular vote but its rival Pheu Thai -- linked to former premier Thaksin Shinawatra -- has formed a coalition claiming a majority of seats in the lower house. Full results will be ratified by May 9 but anger has mounted as the wait continues, prompting demonstrations at two Bangkok landmarks. A small but spirited group gathered near the tourist hotspot Erawan Shrine holding a banner that read "Cheating Election" and "People Want to Vote". It featured the face of 2014 coup leader Prayut Chan-O-Cha, who is standing as the prime ministerial candidate for Phalang Pracharat. "It is the Pheu Thai party which won the election," organiser and activist Anurak Jeantawanich said. Demonstrators were collecting signatures for a petition to demand the dismissal of Election Commission members, who have conceded some errors in tabulation but stand by the latest figures. Other protesters huddled near Bangkok´s Victory Monument. As of Sunday, a separate change.org petition calling for the commission members to be sacked had garnered more than 800,000 signatures online. With parliamentary seats yet to be confirmed, both sides are engaged in a furious bout of horsetrading to convince smaller non-aligned parties to join them. But the overall math favours the junta under rules it wrote. The senate or upper house will be made up of 250 military-appointed members who get to cast votes for prime minister. That means the anti-junta parties need 376 lawmakers -- more than half the seats -- in the lower house to override that advantage and pick their own candidate. Analysts are predicting a deadlock scenario where Prayut is leader but Pheu Thai commands a lower house majority. Parties affiliated with billionaire ex-premier Thaksin have won every election since 2001, but this election has seen new faces emerge in Thailand´s fractious political landscape. Millennial-oriented newcomer Future Forward finished third in the popular vote and has joined the coalition with Pheu Thai.